The Well-Tempered Clavier (Das Wohltemperierte Klavier in the original German) is a collection of solo keyboard music composed by Johann Sebastian Bach. Dated 1722, it contains preludes and fugues in all 24 major and minor keys, dated 1722. It was composed “for the profit and use of musical youth desirous of learning, and especially for the pastime of those already skilled in this study”. The best-known piece from the book is the very first prelude, a simple progression of arpeggiated chords. The technical simplicity of this C major prelude has made it one of the most commonly studied piano pieces for students completing their introductory training. 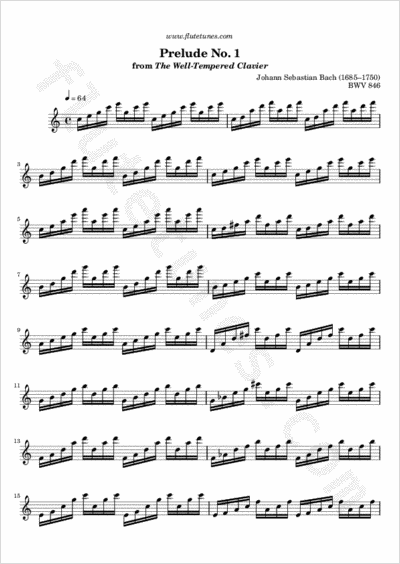 Transcribed for the flute, it makes an excellent lip flexibility exercise. This prelude also served as the basis for the Ave Maria of Charles Gounod.